This summer has been odd. I felt like we were playing the waiting game. We were waiting for the construction drawings, waiting for the city permits, waiting for the sun to come out, waiting for summer to start. Well, summer is over and the city has approved our plans, now we are waiting for construction bids. We are starting the bidding process with our neighbor Dave Funkhouser. He is a good guy with a great reputation in town, but I don’t know if we can afford a general contractor to run this project. We’ll see when he gets back to us. With the demolition and construction on the horizon, time has come to pack up the house and get a storage unit. So I watched a couple of episodes of “Hoarders” to get in the mood to purge our excess stuff and started in on my closet. I was dreading going through my clothes because I had so much. Each time the kids left the house to live on their own I subsumed their closets for my ever expanding wardrobe. I had my clothes spread out in three rooms plus the front closet. Surprisingly purging my clothes was easy. I tend to buy the exact same thing, like a uniform, so I found that I could eliminate the duplicates without much trauma. For example, I had ten, straight, black wool skirts that only a tailor’s discerning eye could tell apart, so I kept one and gave nine to the Good Will. I had fifty pairs of shoes! Now I still have more pairs than I want to admit on the World Wide Web, but fewer than fifty. Heartened by the fast work I made of the master bedroom, I headed for Corrina’s room. Corrina was here this summer and organized her things, so I figured it would be pretty fast. I started with the book case. My rule was if the book was hard bound or inscribed by someone I would keep it, if not it was gone. I kept the Riverside edition of Shakespeare, the big grey book of Art History that my mother gave me when I left for college, and any book with my dad’s handwriting in it. I miss my dad so much and having his books with his handwriting makes me feel closer to him. 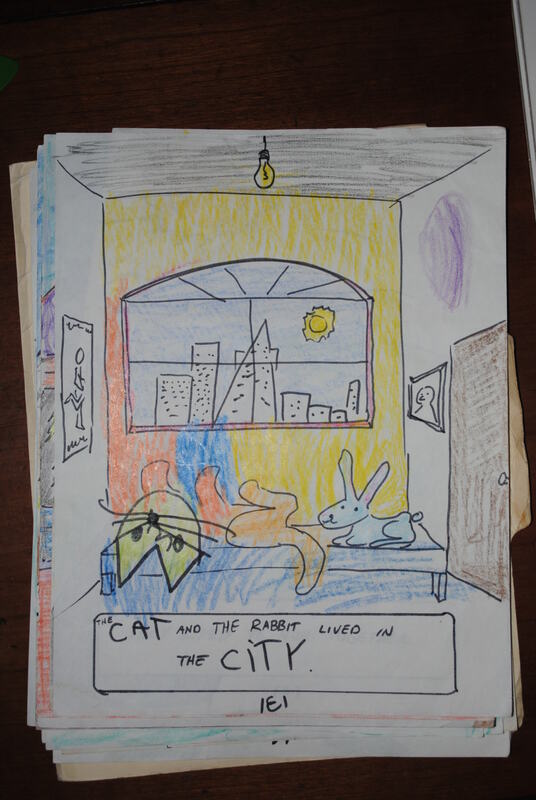 I found Corrina’s first novel, still unfinished, co-written and co-illustrated with Tim titled The Cat and the Rabbit. A keeper for sure! 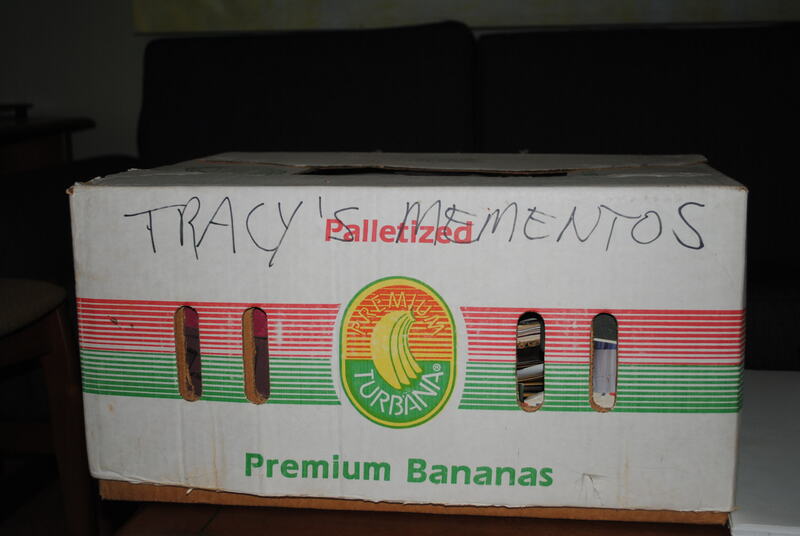 The last time I looked in the box was thirteen years ago when we moved from Irvine to Carlsbad. I knew it was a mistake to pause, but I opened the box and started looking through the artifacts of my life. 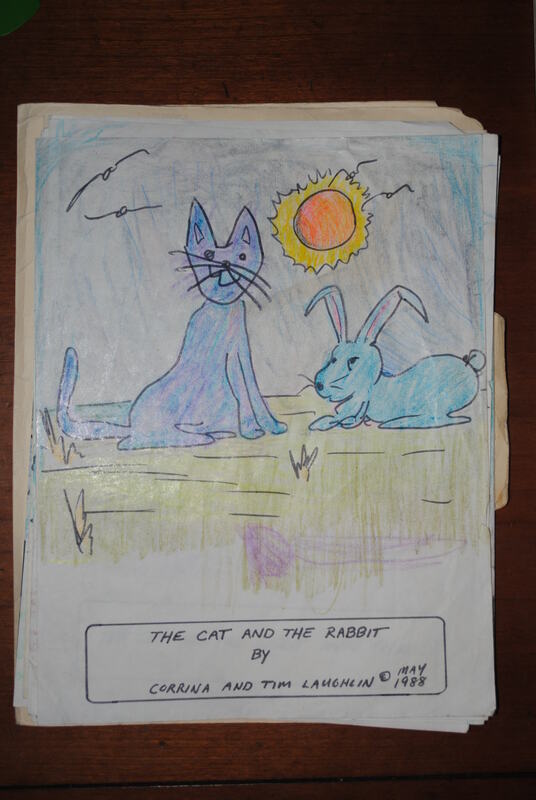 The first layer of keepsakes was mostly comprised of the kid’s cards and drawings that they made at school. There were snapshots of them and their friends. I found a framed studio photo of Tim, Corrina, and me. Corrina was so little she didn’t even have hair yet and she looks a little uncertain about the whole photograph thing. Tim and I look so proud and so very young! I knew I should have just closed the box right then and there and continue packing, but the pull of reminiscences was too strong and I continued with my archeological dig. The next strata down uncovered photos from my college days that pictured some friends still near and dear to me and some friends I have lost touch with. “Some are mathematicians, some are carpenter’s wives, don’t know how it all got started, don’t know what they do with their lives.” I had such a great time in college, so good in fact I never really left. I am sure that the College me had more fun than the Professor me does, but I still love the energy and promise of the academy. The last layer of relics had family pictures with the Clarkes partying on the red couch, us camping, and lots of snapshots of cats. There was a sweet picture of my mother when she was three or four wearing a little dress and bright, white patent leather shoes. She looks much the same now as she did then. I don’t know, but I imagine that my grandma Bertha had that picture taken so she could send it back to her mother in Freeman, South Dakota in order to give her mother a little reassurance that they were doing OK in California. Grandma Bertha and Grandpa Lawrence left Freeman with their two children in the early ’30’s to look for work in the land of milk and honey. And boy I am glad they did. 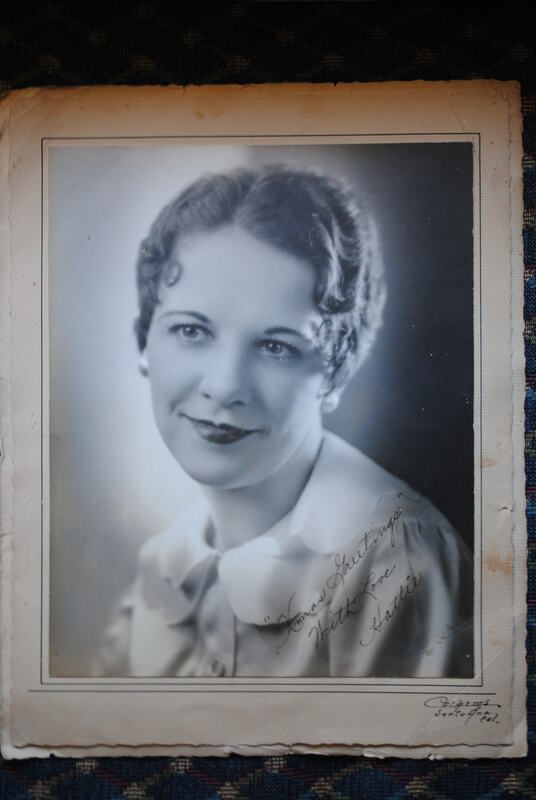 I was just about to put everything back in and close up the box when I glimpsed glamour shot of my great Aunt Hattie, my grandfather’s sister. People in that generation had such great names: Hattie, Gladys, Bertha, Pansy, Viola, Arnie, Leonard, Rosie, just to name a few. Aunt Hattie was one of my favorite people when I was a little girl. She moved around quickly and was a fast talker. I remember being surprised one day when I noticed I was taller than her; she always seemed so big and I always felt so small. Hattie lived through some hard times. She raised a family during the Great Depression and was widowed several times, but she always seemed optimistic. I often think about her and her resilience. When is it going to be done? When people ask me that I have pat answers depending on my mood. “I am not focusing on the completion only on the process.” Or, “In about a year,” Or, “It will never be done.” The real question is when will it start?! We are still waiting on the city permits. It is a big remodel and they are doing due diligence, but really. Let’s get going already! We haven’t been idle during this time. We have been getting Sam’s room organized so we can move in there. 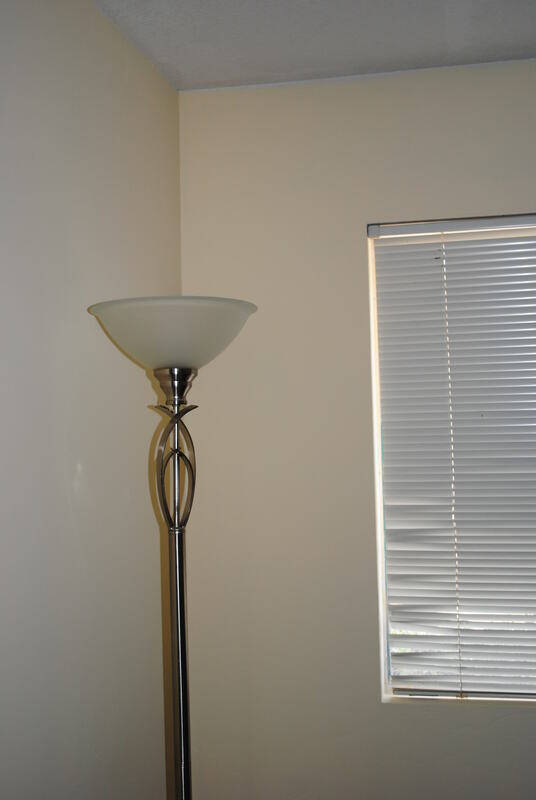 That sounds easy enough, but then you probably have never seen Sam’s room. 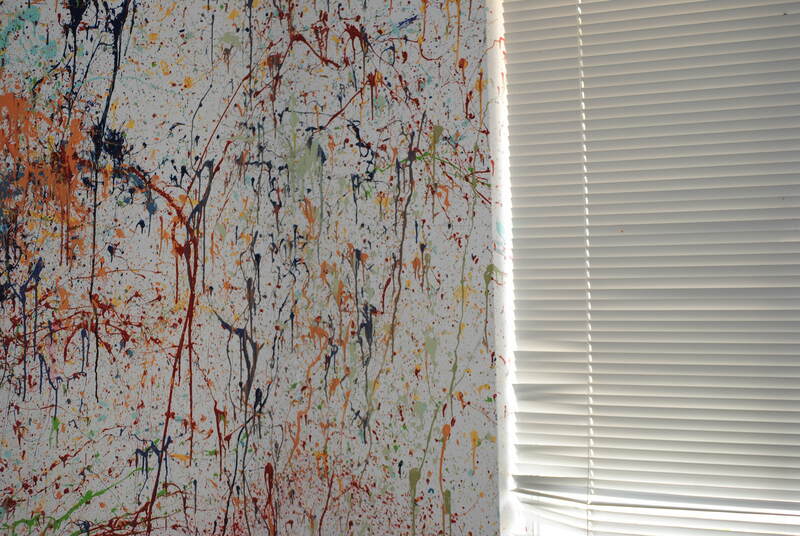 Sam is an artistic guy and about six years ago he asked us if he could paint his room like a Jackson Pollock painting. Tim and I didn’t want to thwart his creativity so we gave him the go ahead. We knew it would be a hassle to fix, but we figured we would deal with that later. After all, that room could be completely torn down during the dream remodel. 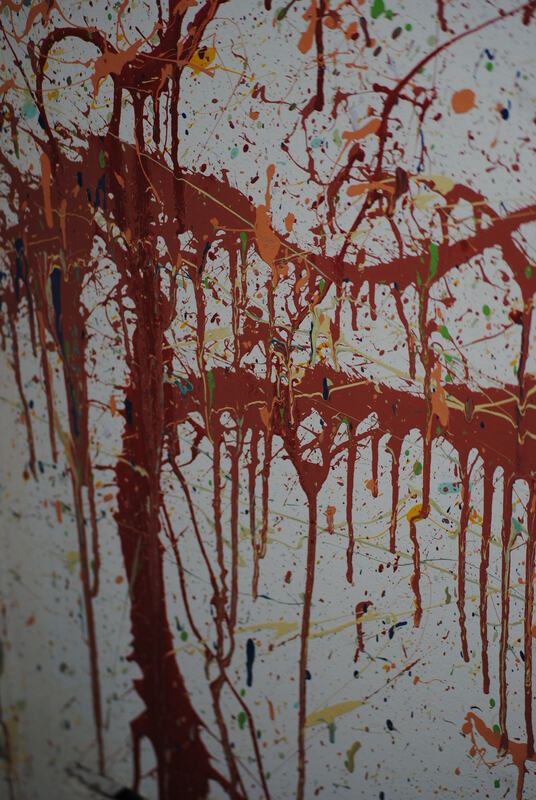 So, Sam and his friend Zach spent an entire Saturday afternoon taking every color of paint possible and throwing it against the walls. 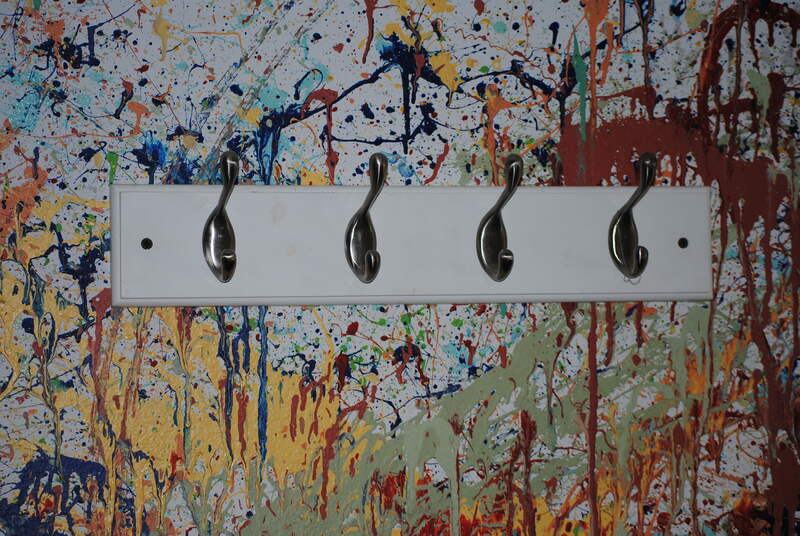 When they were finished there was paint everywhere. Paint on the walls, the fan, the stepstool, everywhere. It looked like a crime scene. They had a blast, we were aghast! Oh well, we said, we’ll deal with the mess when the time comes. Now it is all said and done. I know that when Joey comes to us with some interesting way to decorate his room we will so completely thwart his creativity! All he gets are white walls! damnit!